The Rays rotation is still looking for its first win of the season, but you can't blame starterJake Odorizzi for Friday night's 1-0 loss to the White Sox at Tropicana Field. 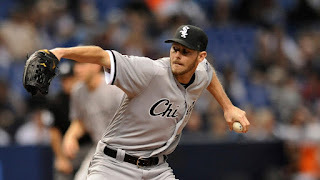 The blame falls squarely on the left arm of Chicago ace Chris Sale, who shut out Tampa Bay and only allowed two hits while striking out nine. "Some nights you just tip your cap, the guy was outstanding," Rays manager Kevin Cash said about Sale. "Chris Sale has done it for quite some time, and he had everything going today for sure." Added White Sox manager Robin Ventura: "He just seemed to be on his game. I think throwing strikes early in counts, too -- you get a guy like him, and you can kind of see the strategy of getting after it early. … Just a great job by him." Smooth Sale-ing: Sale was dominant throughout his appearance Friday, shaking his usual frustration against the Rays. He entered with a 2-4 record and a 4.62 ERA in eight career appearances (six starts) facing Tampa Bay. After Desmond Jennings' second-inning single, Sale retired 16 consecutive batters before Steve Pearce singled to left field with two outs in the seventh. Hard collision: Rays center fielder Kevin Kiermaier and second baseman Logan Forsythecollided in shallow right field in the fourth, with Forsythe catching a popup by Avisail Garciawith two outs and two on. Both were shaken up on the play. Kiermaier stayed down on the field for an extended time, but he walked off under his own power with the training staff nearby. Kiermaier was diagnosed with a head contusion while Forsythe suffered a hip injury. Cash says both will be evaluated when they get to the ballpark on Saturday. Both were replaced defensively to start the fifth. Forsythe's catch prevented a run as Todd Frazier was on third base. Jake shines: In defeat, Odorizzi turned in his most impressive outing of the year. He went seven innings, striking out six and only allowing four hits and a walk. "Really happy with the way Odo threw the ball tonight," Cash said. "Big for him and big for us. He had some not-so-good misses early on on, but after about the third or fourth inning he kicked it in second gear. The positive spot of the night is he kind of locked it in." Imperfect 10: The Rays have lost five of their last six games to begin the season 3-7. It's the second worst start after 10 games in franchise history. The 2011 Rays started 2-8. Tampa Bay's 24 runs through 10 games are the fewest in club history. The Rays have been shut out for 19 straight innings, the eighth time in club history they've been shut out twice in a row. The last time was June 8-10, 2014, against the Mariners and Cardinals. The Rays are the second team to be shut out in consecutive games this season, following the Padres, who were blanked in their first three games, April 4-6 vs the Dodgers. A foul ball from Steven Souza Jr. struck a woman in the second row to the left of the Rays' first-base dugout with two outs in the seventh. A stretcher was deployed to carry her from the stands, though the fan was conscious and talking. Team officials said she was being evaluated at Bayfront Health St. Petersburg. Souza, who walked into the stands as emergency personnel tended to the fan, admitted to be shaken up by the incident. "Its tough, I'd be lying if I said it wasn't. To try and focus back in on facing one of the best pitchers in the AL after you see someone extremely hurt, it's hard" Souza said. "But I have to be a professional." In the ninth, the Rays challenged the ruling that left fielder Desmond Jennings trapped a leadoff single by Jimmy Rollins. After review of the play, the call was confirmed that Jennings did not make the catch. White Sox: Left-hander John Danks will face the Rays at 6:10 p.m. ET Saturday after he allowed seven runs (five earned) and eight hits over five innings in a loss to the Indians last Friday in his season debut. He's 6-6 with a 4.20 ERA in 13 career starts against Tampa Bay. Rays: Right-hander Erasmo Ramirez will make his first start this year. He was used out of the bullpen early in the season, allowing two runs and five hits in six innings. He was 11-6 with a 3.75 ERA in 34 appearances (27 starts) last year. Tampa Bay had used a four-man rotation before Saturday.